“I don’t have any social media accounts” said no one ever. Social media has become a vital part of society. It forces us to process copious amounts of information 24/7, not realizing its influence on us. A huge part of being successful on social media is your ability to influence your audience. Higher education institutions seem to have a much more challenging time grasping the attention of their young adult audiences than the other businesses. Let’s be real here, no one really cares about what is being posted on their school’s Instagram accounts. Judging from the two dozen higher institution social media accounts I analyzed, there wasn’t much that sparked my interest to make me want to hit that follow button either. Effective social media etiquette is crucial when seeking to secure consumer interest, engagement, desired type of followings and number of followers. Improving your social media presence depends a lot on content management, strategy and analytics. To attract consumers to your social media account you must utilize tools that aid in the effectiveness of your content. Due to the increasing number of social media apps available, there have been countless social media management, strategy and analytics apps developed. These apps allow you to improve your social media presence through strategic implementation, gaining consumer insights to help increase engagement and equipping you with the tools necessary to conveniently post, track and analyze your information. Here are a few of the top industry apps that will help you do so and a few universities who have gotten it right. HeyOrca: A DEVENEY favorite, HeyOrca is your ideal social media planner. With an extremely user-friendly interface and convenient approval system, it gives you a centralized place to plan content and put your content into context. Its real-time frictionless feedback and flexibility with content development allows users to have complete creative and distributive control over all aspects of their social media channels. By making the planning and collaboration process seamless while promoting innovation and creativity, HeyOrca is a one stop shop for all things social media management. 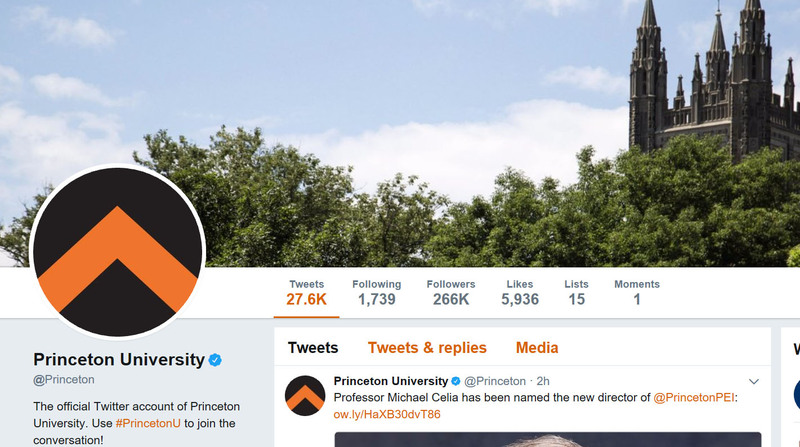 Princeton University, with its 266K twitter followers, has the organization thing down. With a compact body of content, their Twitter page consists of posts that resonate with their users in a timely manner. Its relevant and informative content allows users to look to @Princeton for up-to-date news and information as well as what’s happening on their just as popular Snapchat account. Contentgems: The features that Contentgems offers you will make it easier to create the right content for your target audience and can even help you go viral. By scanning thousands of sites to find the most relevant and timely content using keywords, social signals and advanced filter settings, you are able to use this source to propel your social media content to a much higher level of effectiveness. 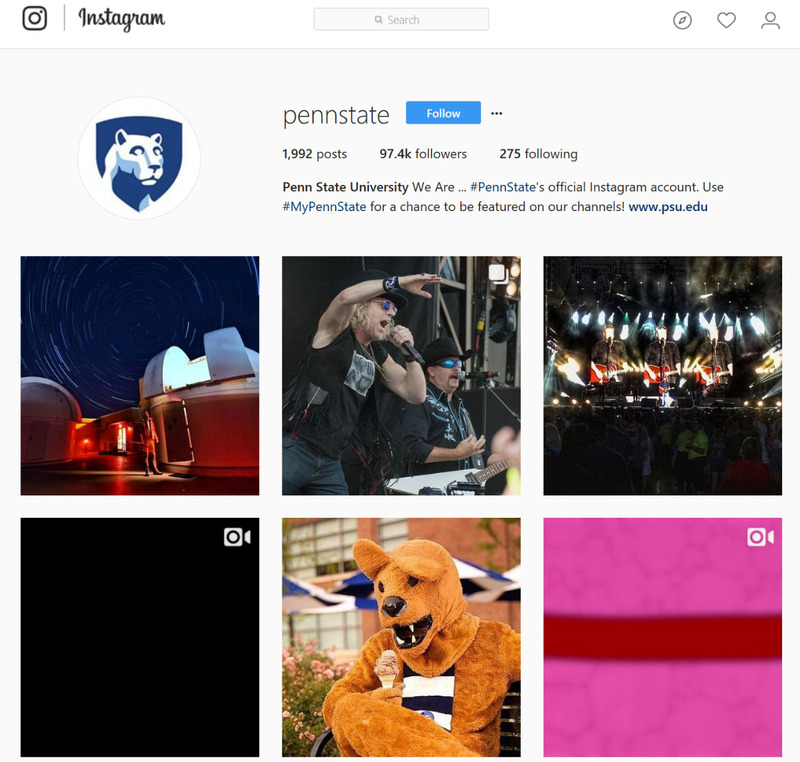 Penn State University has an impressive 97.4K Instagram and 176K Twitter followers, so there’s no doubt that they know what their audience wants to see. Their content is versatile and consists of videos, high-def photos and stunning campus shots. By targeting the direct interests of their young adult followers they’re able to deliver content worth giving a “like” every time. Hootsuite: A force to be reckoned with. This tool helps you save time managing multiple social networks by connecting you with 100’s of apps in one convenient management hub. Tools such as message scheduling, B2B social selling, network managing and social ROI measuring will allow you to maximize your impressions through strategic engagement tactics and in-depth analytics. 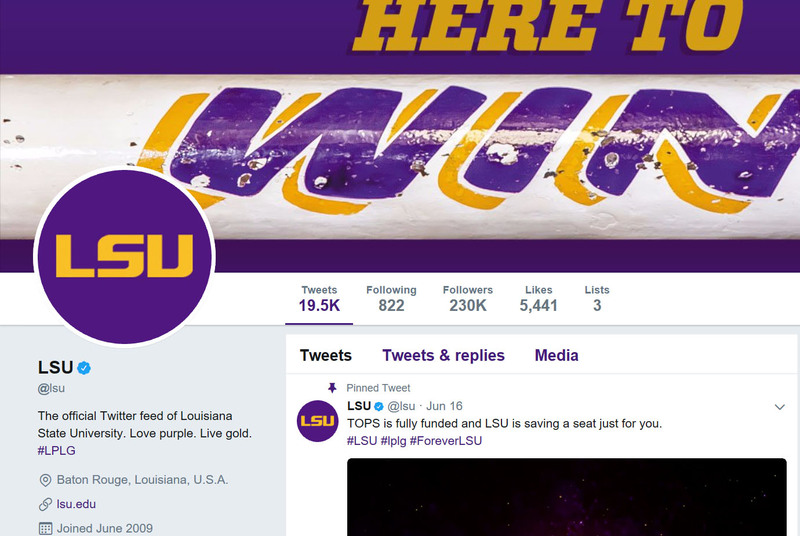 Louisiana State University (LSU) displays a heavy emphasis on the student experience at LSU to its 47.9K Instagram and 231K Twitter followers. Complete with tons of fun GIFs, student life photography and videos and an enormous amount of Tiger pride, LSU’s social media management skills are commendable. LSU also utilizes their competitive followings by cross promoting their other social media handles. Currently #SnapLSU is being promoted through their Instagram to attract followers to their growing Snapchat account. ZuumSocial: This powerful tool helps you quickly generate accurate insights about your target consumer. By giving you reliable data such as content performance analysis, full competitive analysis and full social media systems analytics, you gain new perspective on your analytics. With ZuumSocial you can receive your content performance across several verticals which aid in bettering your performance results. 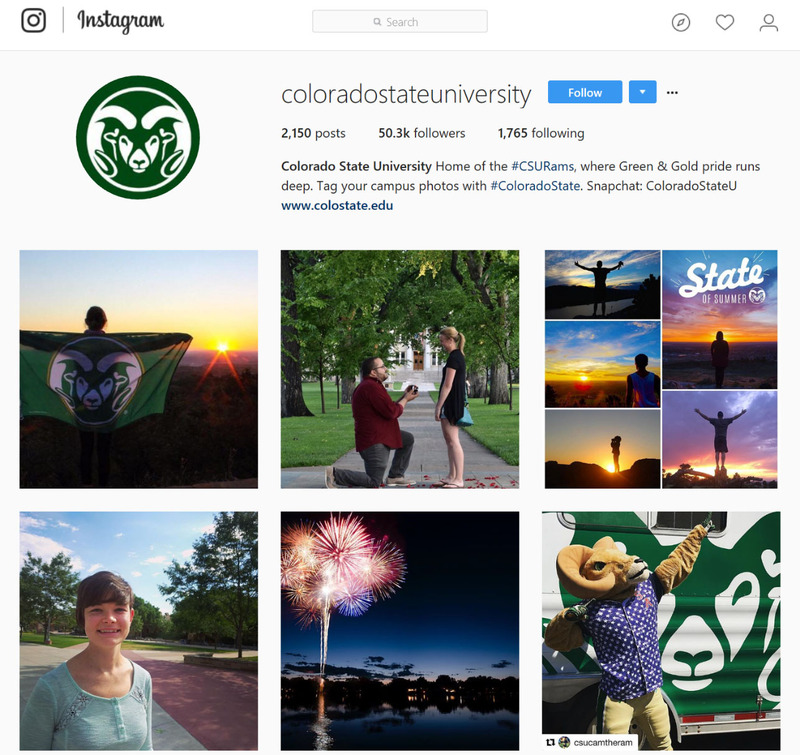 Colorado State University has already mastered understanding what their consumers want. Their Instagram has a diverse content base that covers all bases. From mascot and game day photos to crisp campaign graphics to support their latest sweepstakes, they keep their consumers intrigued. Buffer: This scheduling tool allows you to quickly and easily post to your social media profiles. Buffer also enables you to review analytics that track your engagement and interactions on the posts you have shared to determine how your content is performing and what content resonates the best with your target audience. By implementing Buffer into your social media plan, you will be able to increase the reach of your content while producing relevant and interesting posts. Syracuse University (‘Cuse)– my awesome alma mater –is no stranger to relevant and interesting posts. Its unique mascot, Otto the Orange (yes, an orange), warms the hearts of their 50.8K Instagram followers with his cool accessories and crazy game day antics. 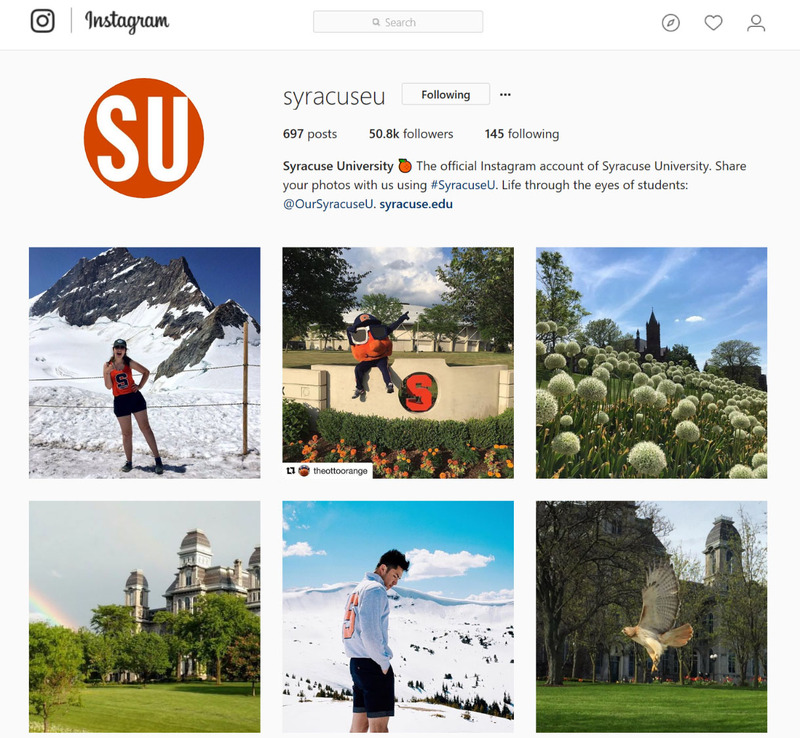 The ‘Cuse Instagram account is filled with anecdotal posts that are “aww” worthy, worldly photography from fellow students and alums and breathtaking campus photography from its scenic Upstate New York campus. The consistency and range of content (along with the beloved Otto) surely keeps everyone following and wanting more Orange. There are a multitude of metrics that are important when building a strong social media presence. Understanding which one is most valuable to the development of your social media account will certainly help in improving your social media strategies. By utilizing at least one of these apps, you will propel your social media presence to another level because you will not only be able to manage your content efficiently, but you will be able to produce relevant content that will target and attract the right audience and gain more engagement and interest.